Flo gets upset when she learns that someone is unaware of Florida’s history as a cattle-raising center. ” Hell, Ponce de Leon started it all in 1521 and it’s been going gangbusters ever since then!” Flo points out. 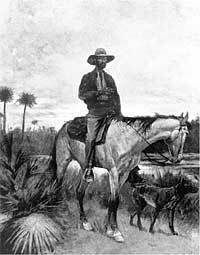 For a long time most of Florida cattle were shipped to Cuba from a dock in Punta Rassa, a town on Sanibel Island, but the Civil War created a second market for Florida beef. The Confederate Army depended on Florida to feed its armies in Georgia, Alabama, Mississippi and South Carolina. Another favorite story of Flo’s about Bone has two versions. V.K. Graham in the Tampa Tribune told of an attempt on the part of several cowboy friends to scare Bone into slowing down his drinking. Bone had arrived in camp dead drunk, fallen off his horse and lay passed out on the ground. 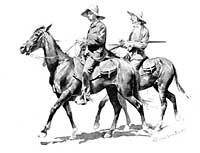 The cowboys rested his head on his saddle and then placed a circle of dried, highly flammable cow dung all around him. The first one up in the morning lit the circle of fire, tugged Bone awake while they pretended to be asleep. Bone stood up, looked at the ring of fire, uttered an oath and commented to the heavens, “Well, by God! Dead and in hell! And I’m the first one up. “Another version related how Bone, passed out again, was deposited in a graveyard and one cowboy stayed in the cemetery hidden behind a nearby gravestone. He reported that Bone came to in the morning, sat up rubbing his eyes and staring at his surroundings. In his own ingenious style, Bone commented, “Here it is Judgment Day, and I’m the first one up.” Flo thinks both events happened. Jim Bob Tinsley, in his book about Bone, tells the various versions of what’s reputed to be the greatest legend of Bone’s humorous life. It starts with his good friend, John Underhill, becoming sick and Bone riding to the cow camp to take care of him. After a few days, John died and Bone admonished the cow hands who were preparing to wash the body before dressing it for burial, “Hellfire no, you ain’t going to wash him. You all know he’d never allow it if he was alive and you all ain’t going to take advantage of him now he’s dead.” Subsequently, a young boy from a wealthy New Orleans family drifted into the area became mesmerized by Bone and followed him wherever he went. The boy was described as weak and sickly and he died shortly thereafter with only Bone to take care of his burial. Bone buried the young man next to where he had previously buried his friend John. When the young man’s family eventually learned of his death, they sent several hundred dollars to the local undertaker to exhume the body and send it by rail to be reinterred in the family plot. The undertaker paid Bone to retrieve the body. Two things bothered Bone on the way to the gravesites. The young man, he knew, was fed up with trains and traveling and never wanted to go home again. On the other hand, his friend, John, had always wanted to take a train ride and had never been able to afford to do so. The answer was obvious to Bone and since he was the only one who knew which grave was which, he pointed out the wrong site to his helpers. To Bone’s mind, he had done right for both. 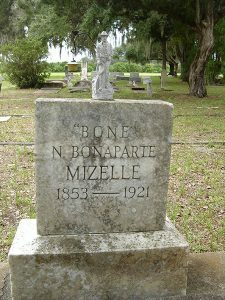 The only sad note in the entire tale was that Bone Mizell was only 58 years old when he died. Entered, as the cause of death on the certificate was “Moonshine, went to sleep and did not wake up.” His funeral was held in Arcadia and he was buried in the Joshua Creek Cemetery. It was nice to read yet another set of stories about Bone. He was my cousin several times removed and I believe that most of the stories are absolute truth. I am one of the last Mizell’s from my line and my family has deep roots in Pine Level, Florida between Arcadia and Sarasota. One story never told was about my Grandfather on my mothers side Judge Lewis Purvis and Bone. One evening Bone in his usual alcoholic state hired my Grandfather who was at the time about 5 years old to drive him around the thriving town of Nocotee. Not only did he hire the five year old to drive while he sat in the back seat but made sure that his driver had an abundant supply of cheap cigars to smoke during the trip. I’m a local free-lance actor. I just got cast at the Orlando History Museum to do living histories. One of the characters that I have been cast to do is Bone Mizell. It’s their script but I’m going to do all I can to research and portray him with as much accuracy as possible. If they ever decide to do the movie, I’d love to be part of it. What a rich role you’ve gotten. Good luck on this opportunity and I wish you luck in getting the movie role. Florida doesn’t have all that many characters in its history that are as interesting and fun. The state ought to finance the production itself with all the attention it would bring to its history. Haven’t thought about Bone Mizell in years. Did a series of TV shows on WINK-TV with Frog Smith, a cracker and artist from Fort Myers. He had stories that went on forever about Bone. I guess my favorite was how Bone was dared to go into the bush after a longhorn and brand him with nothing but his jack knife. Bone went in, there was a whole lot of huffing and snorting from that old bull, and then Bone came out smiling. Said he’d lost his jack knife, but he branded the bull’s ear with his teeth. It was fun to think of him again.